ExpORL: Research Group Experimental Oto-rhino-laryngology: Just published: Efficient hearing screening in noise-exposed listeners using the digit triplet test. Just published: Efficient hearing screening in noise-exposed listeners using the digit triplet test. Hearing screening in occupational medicine is generally based on pure-tone threshold audiometry. However, reliable and valid thresholds can only be obtained in a sound-proof room, using a high-quality, well-calibrated audiometer, and by a well-trained administrator. Thresholds also need to be determined for several audiometric frequencies. This makes the test time-consuming and expensive, which is not ideal for the screening of large populations. A Speech-In-Noise test (SPIN), by contrast, does not have the abovementioned requirements. Because it can be implemented as a quick automated self-test, possibly over the Internet, a SPIN test is highly advantageous for screening purposes. However, its sensitivity for (isolated) high-frequency hearing loss, as typically seen in noise-exposed listeners, was unclear up to present. In this study, the authors investigated the sensitivity and specificity of the Digit Triplet SPIN test for detecting and monitoring (early-stage) high-frequency hearing loss, and its similarity across two different language versions. Design: One-hundred eighteen noise-exposed workers, representing a wide range from no to severe high-frequency hearing loss, completed the French or Dutch version of the broadband Digit Triplet self-test in an office-like room. Pure-tone thresholds, collected by a professional audiologist in favorable settings, served as the reference. 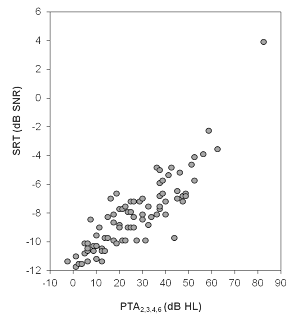 Results: The 84 Dutch-speaking participants showed a very strong linear relation between the reference and the Digit Triplet test, with the pure-tone average at 2, 3, 4, and 6 kHz as a strong predictor (R = 0.86) for the speech-reception threshold. The sensitivity and specificity to detect mild high-frequency hearing loss were 92% (61 of 66) and 89% (16 of 18), respectively. 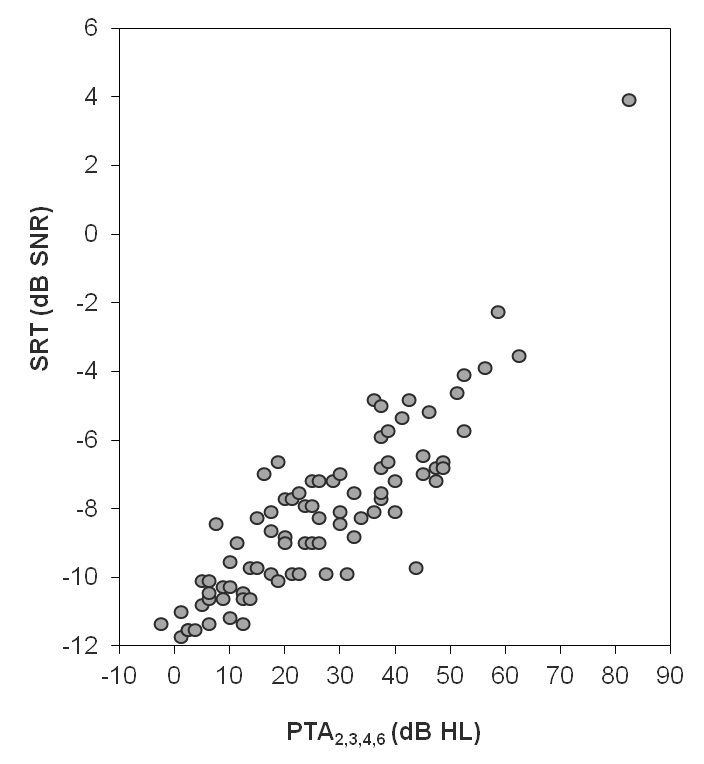 The area under the receiver operating characteristic (ROC) curve was very high (≥0.91) for several degrees of high-frequency hearing loss. With a within-subject standard deviation of only 0.8 dB, the Digit Triplet test also had a low measurement error. The results of the 34 French-speaking subjects showed a highly similar trend. Conclusions: The Digit Triplet test proves to have a high sensitivity and specificity for detecting different degrees of high-frequency hearing loss. Given its ease of use, this test is very suitable for screening purposes in occupational medicine, and potentially for the screening of adolescents at risk of recreational noise-induced hearing loss. Jansen S., Luts H., Dejonckere P., van Wieringen A. & Wouters J. 2013. Efficient hearing screening in noise-exposed listeners using the digit triplet test. Ear and hearing, 34, 773–8.